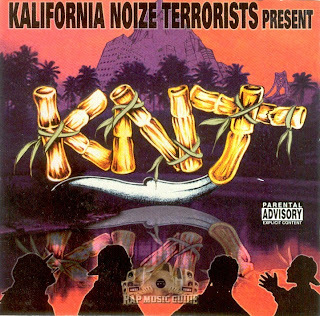 After years of searching, I was able to track down the only album from The Kalifornia Noize Terrorists aka The Knuckle Neck Tribe. In the end it really wasn't hard to find this album, I bought it for $0.75 + shipping on Amazon and a week later it was in my hands...thanks Internet. I've always enjoyed KNT's music, especially the earlier 12"s, you can find a track from their Meditation/You Know 12" on a mix tape I posted a few months ago. I'm not to sure why this album eluded me for so long, the only other person I've spoke with who had a copy was Eons One, who was working on a post about the group for Ripped Open By Metal Explosions a few years back but I don't think was ever published. In the end I enjoyed the album, it had some guests on it I didn't expect to see, most notably San Quinn who raps on 2 tracks, Equipto who kills it with Spank Pops on a track and Dj Apollo. Jibs, here is a request that I hope you have cause there's a DSP rip. The album's name is "Purgatory" and it is by The Scribe. Year: 2000. There is a rare Circus feature on it!